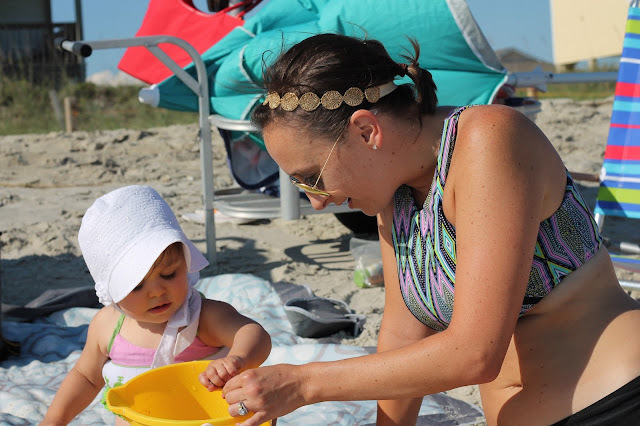 Last year as I fearfully shielded our 3-month old baby under the beach tent, freaking out internally, I had no idea how much FUN the beach would be a short year later. I couldn't resist sharing a few more photos from our Oak Island trip this past month. We had the best time and already are looking forward to a return trip next year! I know, I know, LOTS of Camille photos, but with such a smiley happy beach baby, I couldn't help myself! Such a happy, happy little lady! Adorable photos! Your parents look AMAZING! You need to do a post with them about how they stay so young ie eating, fitness, etc. Those bathing suits are too much!! She is such a little water baby, looks like you all had a great trip! So cute! I love all of her bathing suites, so cute! So sweet! She definitely loved the beach! She is such a doll baby! So much fun! Where is your one piece from? I love it! Looks like a lot of fun and Camille is way too adorable! 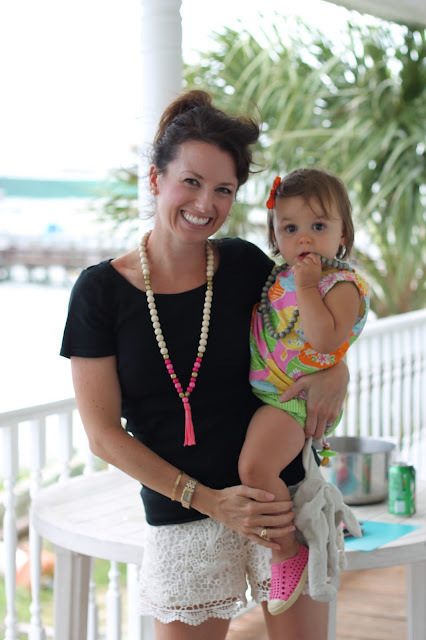 adorable pics of a fun loving beach babe! there are some really fantastic ones of the two of you - I'm so thrilled on the rare occasion I get one of me and L that is frame worth!! and that white eyelet bonnet- precious! So many precious pictures!! And seriously - your beach hair is amazing! Not everyone can pull that off :) Love sweet Camille enjoying the beach - really is there anything cuter than kids and the ocean!? Love all those photos! And you have such a beautiful family - all y'all are gorgeous!